New Orleans Liberals are chortling to themselves at the highly public, front page falling out of Rasputin and the Czar. Whoops, wrong country, I meant Stephen Bannon and President Donald Trump. And, probably, wrong comparison, since Rasputin was the power behind the throne, and Bannon has been the thorn on the cushion of the president’s swivel chair. 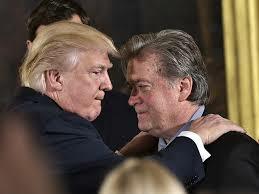 Sure, Bannon had this coming as he continually kept tripping over his own ego, and no matter how dumb he thinks the President’s wife is or how traitorous this son and son-in-law might have been, or how clueless he thinks the President himself might be, he had to know this was all going to stick to his shoes and leave tracks everywhere. Fact or fiction, threats of libel lawsuits, and attacks on free speech aside, there are other lessons to learn from the fast falling Bannon. A big one for right, left, and in between, is that not only will the “revolution not be televised,” but it will also not be funded by the rich. Embed that in your mind in bold with an exclamation point, because Bannon is proving this on the right side of the political spectrum in the same way that it should certainly be gospel on the left as well, constant proposals notwithstanding. Although this should be as simple as an elementary school lesson, billionaires and their buddies up and down the scale of the rich are first and foremost about the billions and millions and their families, friends, and companies. Change scares them. Conflict is to be avoided. Secrecy is to be prized. Their world is transactional, not transformative. If they want to throw the rock, they want to hide their hands. It is unbelievable that Bannon did not know this completely or could have been so caught up in the drama of a bigger stage that he forgot these foundational truths. And, in a corollary, to believe that a populist “revolution” is in their interest is even more absurd, because, right or left, the people themselves and their interests would have to really, really matter, rather than being instrumental for their own purposes. So, sure Breitbart News could throw bricks through the window day and night, who cares. Speaking of schoolyard lessons, those are just words, and it’s only sticks and stones that can really hurt them, and for the rich that doesn’t mean a physical beating but something worse like loss of personal reputation, community standing, and of course hard currency. Populism is about people, and when the change you demand is not for people, but for this or that sidebar craziness that distracts and polarizes rather than empowers, then the leaders will be disappointed and the donors will disappear. Bannon will learn this. He won’t disappear, but his revolution among Republicans is likely over to no one’s surprise certainly. Who ever believed that Republicans wanted a revolution as opposed to tax cuts for themselves and their companies and looser regulations to facilitate robber baron, no consequence capitalism? But, this isn’t just a lesson for the right. The left needs to pay attention in class too. If people are not driving and funding the revolution, it will be a footnote in some other book, less widely read than this current political gossip tract. If you don’t believe it, ask Stephen Bannon. This entry was posted in Ideas and Issues and tagged Stephen Bannon, Trump Administration by Wade. Bookmark the permalink.